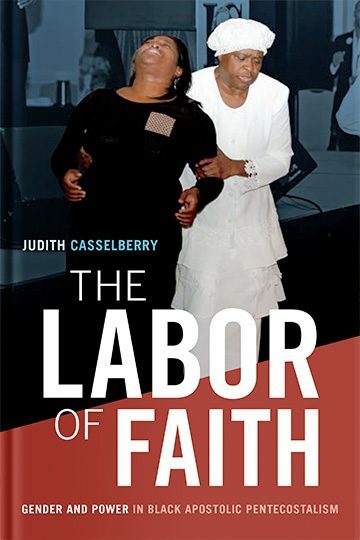 In The Labor of Faith Judith Casselberry examines the material and spiritual labor of the women of the Church of Our Lord Jesus Christ of the Apostolic Faith, Inc., which is based in Harlem and one of the oldest and largest historically Black Pentecostal denominations in the United States. This male-headed church only functions through the work of the church’s women, who, despite making up three-quarters of its adult membership, hold no formal positions of power. Casselberry shows how the women negotiate this contradiction by using their work to produce and claim a spiritual authority that provides them with a particular form of power. She also emphasizes how their work in the church is as significant, labor intensive, and critical to their personhood, family, and community as their careers, home and family work, and community service are. Focusing on the circumstances of producing a holy black female personhood, Casselberry reveals the ways twenty-first-century women’s spiritual power operates and resonates with meaning in Pentecostal, female-majority, male-led churches.